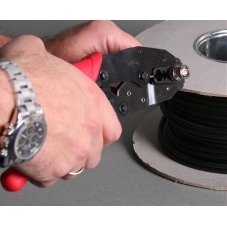 Traditionally coaxial or co-ax cable has been the preferred method of professional installers. In recent years though Cat5 cable has knocked co-ax cable off that top spot. Compared to Cat5 co-ax is bulkier and it also requires the use of specialist crimping and cutting tools if satisfactory results are to be achieved. 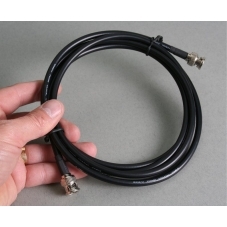 All the coaxial cable we supply is RG59 and suitable for CCTV installation. We supply either simple RG59 or RG59 plus 2 cores, commonly known as "shotgun" cable. RG59 on it's own can be used to transfer the video signal from a CCTV camera to a DVR recorder or the monitor signal from a DVR to a TV / Monitor. Shotgun cable can also handle the power feed from transformer to CCTV camera as well as the Video signal from the camera to the DVR recorder. Although bulkier than Cat5, especially when dealing with multiple camera feeds co-ax cable can still be cut to length and pulled through holes and cable runs. As well as Co-ax cable we can supply all the necessary crimping and cutting tools. Call us with your needs. - Choose how many metres in length you need the cable to be then purchase a connectors and make up pack. We do the rest for you.